Philadelphia, PA; November 18, 2013—Women with depression in the perinatal period experience a high degree of conflict in deciding whether and how to treat their depression, but strongly prefer treatments other than antidepressant medications, reports a study in the November Journal of Psychiatric Practice. The journal is published by Lippincott Williams & Wilkins, a part of Wolters Kluwer Health. The preliminary study, led by Cynthia L. Battle, PHD, of the Warren Alpert Medical School of Brown University, Butler Hospital, and Women & Infants' Hospital of Rhode Island, helps to fill the gap in knowledge about women's preferences and decision-making patterns regarding treatment for depression during and after pregnancy. The researchers performed in-depth interviews with 61 pregnant women at 32 weeks' gestation. Participants were a subset of women enrolled in a longitudinal study focused on understanding the impact of prenatal antidepressant use and prenatal maternal depression on fetal and neonatal outcomes, and about half of the women in the research sample were clinically depressed. Depressed women participated in further interviews to assess their experiences and preferences regarding depression treatment. Levels of "decisional conflict" related to treatment for depression during pregnancy were assessed as well. Women with perinatal depression were younger, had lower socioeconomic status, and were more likely to be single than nondepressed participants. Depressed women also had increased levels of anxiety and greater impairment in marital/family relationships—underscoring the need for treatment. Although about 70 percent of the depressed women received some form of depression treatment during pregnancy, they often reported conflictual feelings concerning depression treatment decisions during pregnancy. Indeed, one-third experienced a high degree of uncertainty and confusion. Women who were more uncertain about their treatment decisions had higher levels of depression, and were less likely to engage in treatment. Some depressed women expressed positive feelings about treatment. However, as in previous studies, women were more likely to prefer non-drug treatments for depression, such as psychotherapy and alternative therapies. Many women said they would consider using antidepressant medications during pregnancy only as a "last resort." 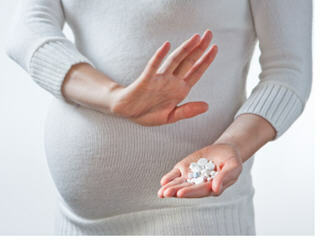 Concerns included fear of possible adverse effects on the developing baby, including withdrawal symptoms, premature delivery, and childhood learning problems; feelings of shame, guilt, and confusion about using antidepressants during pregnancy; and the potential for the infant becoming dependent on these medications. All of the women in the study—regardless of depression status—were asked about their preferences for treatment if they were to experience an episode of postpartum depression. Most said that they would prefer some form of psychotherapy over medication, expressing concerns about possible effects of antidepressant exposure through breast milk. Again, the women strongly preferred alternative treatments. Previous research has reported women's "general reluctance" to take medications during pregnancy and the postpartum period. This new study was designed to characterize the concerns, preferences, and motivations influencing women's mental health treatment preferences—particularly regarding antidepressant drugs—during the perinatal period. The results "point to a need for greater decisional support for depressed perinatal women who are grappling with difficult treatment decisions, as well as enhanced support and training for clinicians who provide care for these patients," Battle and colleagues write. They add, "Providing increased psychoeducation as part of the decision-making process may also help patients feel more comfortable with certain treatment options—including antidepressant medications—as information is discussed regarding the known risks and potential benefits in the context of an individual's symptoms and treatment needs." Given women's concerns about using antidepressants, it's important to increase awareness regarding effective non-drug treatments for depression during pregnancy, Battle and coauthors believe. They call for further studies of all possible options for treatment of perinatal depression, including medications, specific forms of psychotherapy, and alternative treatments such as yoga, exercise, and light therapy. "Perinatal Antidepressant Use: Understanding Women's Preferences and Concerns," Battle, Cynthia l.; Salisbury, Amy L.; Schofield, Casey A.; Ortiz-Hernandez, Samia. Journal of Psychiatric Practice. 19(6):443-453, November 2013.